This is the story of the fighting underground of the Jews of Kovno, Lithuania, in World War II. The authors, historians Zvie A. 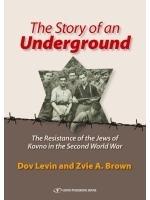 Brown and Dov Levin, were themselves members of the Kovno underground, and this well-researched book – based on documentary material, verbal testimonies, and written memoirs of witnesses, among other sources – is supplemented by the authors’ own personal accounts. The authors here describe the first steps of the organized Jewish underground in the Kovno Ghetto, its desperate search for allies outside the ghetto, and its first bloodstained attempts to break through the ring of isolation and establish a base of support for partisan battle. They relate the insurgence at its height: contacts with partisans in the forest, acquisition of weapons and equipment, and training of fighters for partisan warfare. They also analyze the complex relationship between the Jewish fighting organization on the one hand, and the Council of Elders and the Jewish police on the other, as well as the active assistance these official organizations gave to the underground. The text goes on to describe the operations of the partisans, many of whom were fighters from the Kovno Ghetto, and the process by which the fighters were accepted into Soviet partisan units. The authors paint a picture of daily life in the partisan brigades, including the tense relationship between the Jewish and non-Jewish fighters. They relate the final days of the underground as the ghetto was being destroyed, and then the last journey of the Kovno brigades from the forest bases back to liberated Kovno.